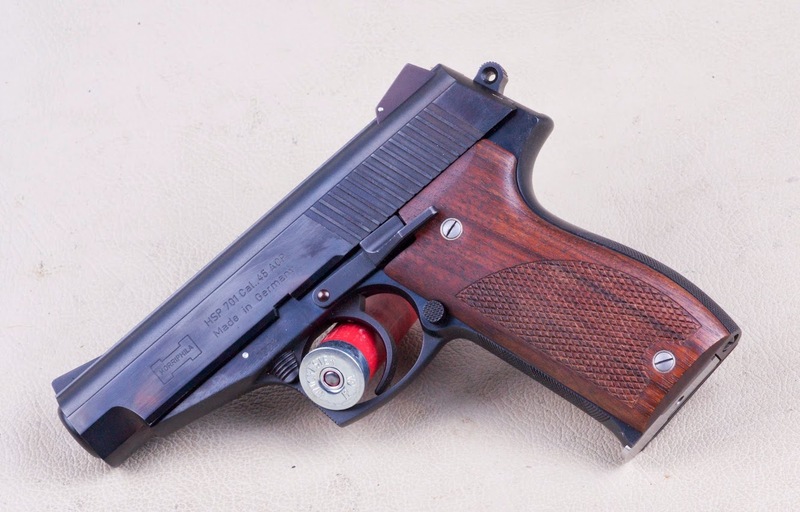 For auction: 1984 4″ .45 ACP double action Korriphila HSP701 serial number 023. In a simpler time, an armorer with an order for personal weapons measured his man and his man’s pocket-book and straightforwardly hammered and clanged out the requisites. Everything was just about one-at-a-time anyway. Even the complication of gunpowder didn’t change that for centuries. Indeed, 150 short years ago, that was how it was and therefore all those splendid cased pistols, Pennsyltucky rifles and long fowlers. Here lately, however, anything really personal in a handgun — if it was to be up-to-date — meant the conversion, alteration and/or embellishment of some factory arm. That may be changing, and colleague Jeff Cooper rather likes the idea. 1. Choice of eight calibers, 45 ACP and 10mm down to 9mm Ultra. 2. Four- or six-in. barrel length. 3. Single-action only; double-action only; or selective for both. 4. Finish of choice — black or white. 5. Control levers, trigger, and the like sized to order, and placed (in the case of slide-stop and magazine release) where wished. 6. A normal list of sight and shape (square trigger guard? hook trigger guard?) options. All except 38 Special and 9mm Ultra have Budischowsky’s single-roller-delay blowback action. The barrel is rigid; the sights adjustable; the magazine a single-column affair. “These pistols were each a pleasure,” Cooper said. “The pulls were clean and sharp, the feel fine, the sights just right. In a 35-ounce gun, of course, the recoil was light.” Cooper has long felt eight shots upon command, as in the Model 1911 Colt, are enough and has no problem with the Korriphila’s magazine capacity. (His exact words were: “If one cannot solve his immediate problem with six or eight well-placed shots, it is doubtful that he can solve it with 10 or 12.) But he does think the gun a tad bulky. Cooper thinks nearly all the service pistols in the world are a little bulky, matter of fact, but has hopes that this design effort may one day provide all the gun he wants and less — that is, if enough cash customers bespeak Korriphilas, and enough of those want slimness with their quality, perhaps it will happen. Among the Budischowsky design’s real — if invisible — charms is the idea of it. There is no way Korriphila was meant for the military or for the police — it’s for individuals. That’s refreshing. In view of the continuous complaints we get about the sale price of the Steyr Scout, we now offer a proper response. It seems that Herr Budischowsky of Eislingen, Germany, is now offering what he considers to be the pistol to end all pistols. This is the “Korriphila Model HSP 701” and its retail price in Germany is 15,900 Deutsch Marks. (Last we heard there were about 1.7 DM to a US dollar.) This, of course, is in its deluxe version in solid Damascus steel. Its less ornamental brother in plain blued steel is way down at DM 8,000. Basically it is a 9mm crunchenticker, but it may be offered in the future in a major caliber. I do not know if Herr Budischowsky is taking orders at this time, but you might check with him at the SHOT Show. This precision-engineering business is best known in gunmaking circles for handguns designed by Edgar Budischowsky. These were originally distributed exclusively by Waffen-Frankonia of Würzburg, but the current products are promoted by Intertex-Korriphila of Eislingen. TP-70 Apart from double-action lockwork and exemplary quality, this was a conventional blowback design with a slide-mounted safety catch. It was sold in the USA in the 1970s as the “Budischowsky”, honoring its designer. HSP-701 (1982 to date) An interesting delayed-blowback pattern, this relies on a separate breechblock within the slide and a transverse roller. When the gun fires, the roller has dropped into a recess in the frame and prevents the breechblock from moving back until an operating finger on the slide raises the roller out of its seat. Only about 30 guns are being made annually, confined to 9mm Parabellum (nine-round magazine) and 45 ACP (seven rounds), although 7.65mm Parabellum, 9mm Police, 9mm Steyr, 38 Special and 10mm Norma options have all been offered in the past. The guns have 4- or 5-inch barrels and weigh about 39-42 oz depending on their features. A few single-action examples have also been made. Odin’s Eye This is a fascinating deluxe version of the basic HSP-701, differing from the standard pattern in the material of the frame and slide. It is the only automatic pistol ever to have been made in hand-forged damascus steel. The guns are fantastically expensive, but truly “one-of-a-kind”, as the patterning on the metalwork is unique to each particular component.